Eliminates Airborne Bacteria, Odours and fragrances the ambiance 24 x 7. Light sensor makes this machine dispenser unique which saves wastage of fragrance. Light sensor mode enables the machine dispenser to be operated in Day or Night mode automatically. Works on two AA size Batteries, which lasts upto 3 months or more depending upon usage. Eight time control interval spraying options of 7.5 Minutes,15 Minutes and 30 Minutes. Facility of locking the machine dispenser is provided. It can fit 250 ml and 300 ml Airance air freshener refill. It’s a Self Standing machine dispenser which can be Wall Mounted also. 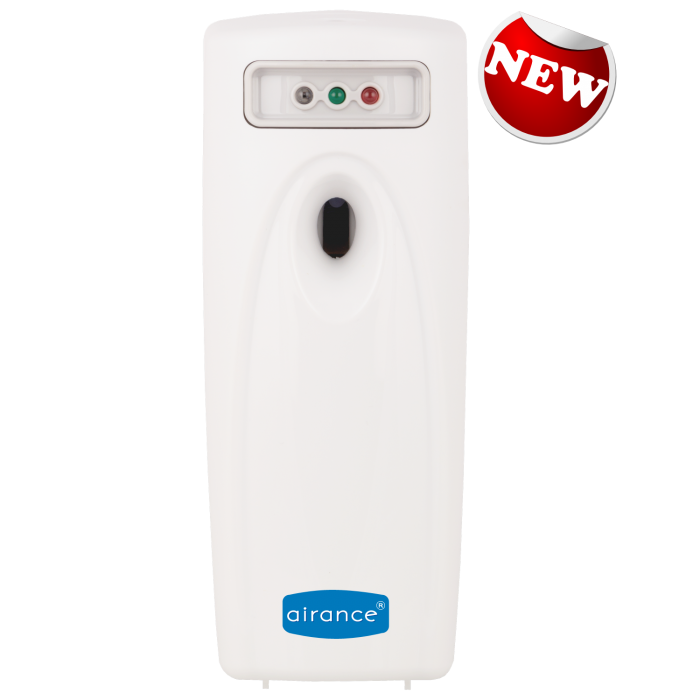 Aesthetic design and features makes this air freshener machine dispenser ideal for homes, offices, hotels, shops, hospitals and other public places. Light weight (320 gms), Small size (Length 3.34 inches x Width 3.22 inches x Height 8.26 inches) and convenience of placing the unit anywhere. 2 Years Manufacturer Warranty on the machine dispenser. Call our customer care for complete telephonic demonstration of the machine dispenser, it’s features and installation procedure. Prices are inclusive of all the taxes. For repair & servicing of the machine dispenser, facility of door step pick up – drop of the machine is provided on request, saves time to visit the service center. Repair & servicing of the machine dispenser is also provided even after the expiry of the warranty period at nominal charges.